The heat in So Cal lately has been UNBEARABLE. That means it is NO fun to meal prep and turn the oven on to make it even hotter. 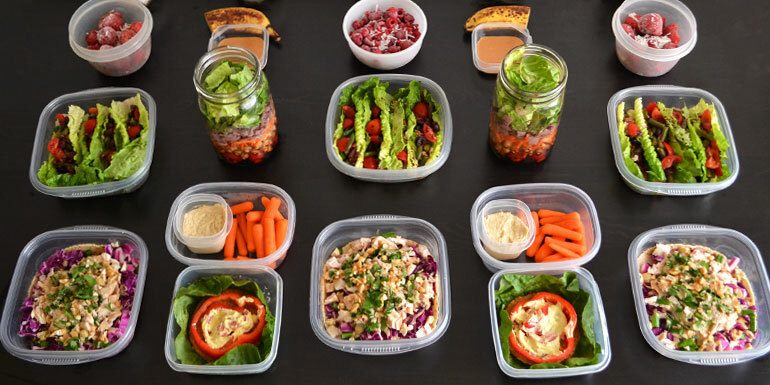 With that said, we STILL have to meal prep so when one of the coaches on my team found this no cook meal prep plan blog post, I HAD to share it with you guys!! 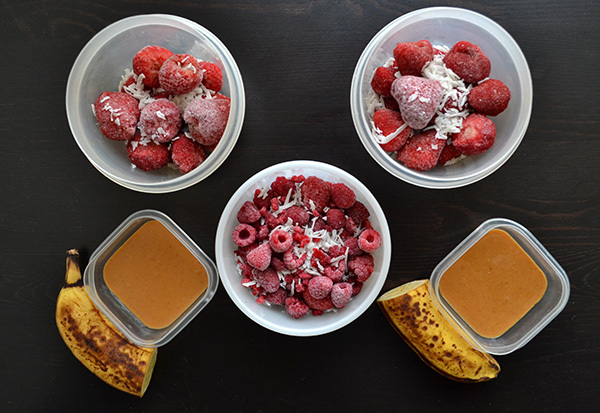 This meal prep is ideal for a summer heat wave, if cooking isn’t one of your strengths, or if you simply are too busy and don’t have a lot of time to spend on meal prep. 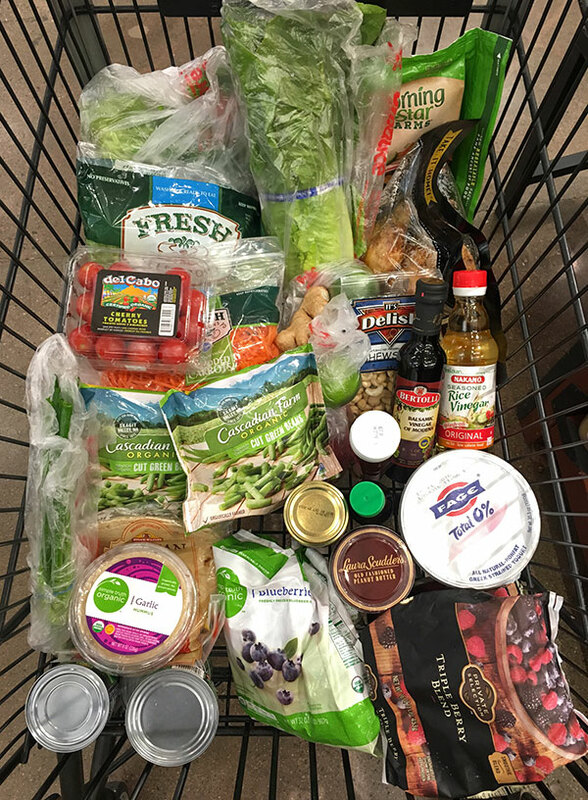 Follow this guide to make your own no-cook meal prep, complete with step-by-step instructions and a grocery list. It’s made for the 1,200–1,500 calorie range. Here’s what your meal plan for the week will look like when you’re done. T/TH: Shakeology with ½ banana and 2 tsp. nut butter = 1 Red, 1 Purple, 2 tsp. 1. Make the overnight oats. 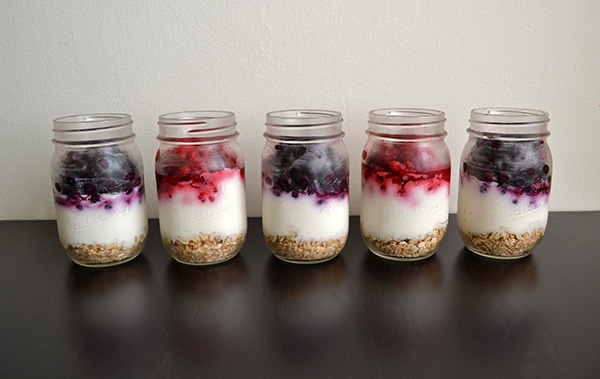 Place ¼ cup oats and ¾ cup Greek yogurt in a Mason jar or food storage container. Top with one cup of fresh or frozen fruit. 2. Thaw the frozen green beans, then prepare the Tuna Niçoise Lettuce Cups. Between four lettuce leaves, divide one can of tuna, ½ cup thawed green beans, ½ cup chopped cherry tomatoes, and five chopped olives. Dress with a lemon wedge or balsamic vinegar. 3. Prepare the Roast Beef Salad. Combine 1 cup lettuce, ½ cup cherry tomatoes, ½ cup shredded carrots, 3 oz. deli roast beef, ½ cup beans of any kind, and dressing. 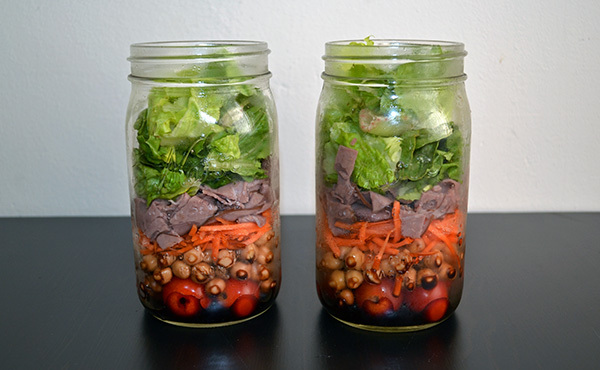 If you are using a mason jar, place the dressing at the bottom and the lettuce on top. 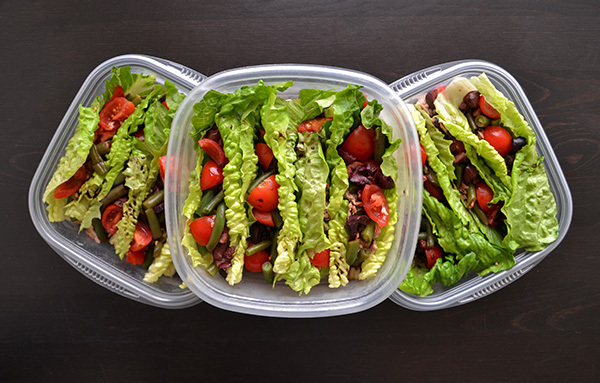 If you are using a food storage container, place the lettuce at the bottom. 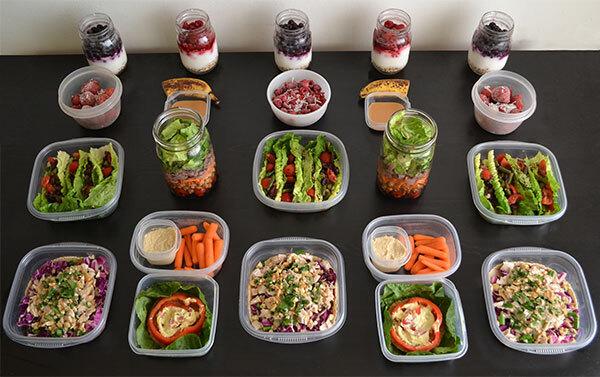 You can dress the salad during the meal prep, or wait until the day you eat it. 4. Make the Peanut Lime Dressing. Place 2 Tbsp. water, ¼ cup smooth peanut butter, 2 Tbsp. fresh lime juice, 1 Tbsp. rice vinegar, 2 tsp. finely chopped fresh ginger, 2 tsp. reduced-sodium soy sauce, and 2 tsp. raw honey in a blender, and blend until smooth. 5. Prepare the Asian Chicken Wrap. Set out three food storage containers and place one 6-inch whole wheat tortilla in each. Chop 8 raw, unsalted cashews; chop cilantro or parsley (to taste); and chop green onion (to taste). On top of the tortilla, add 1 cup shredded cabbage, 3 oz. 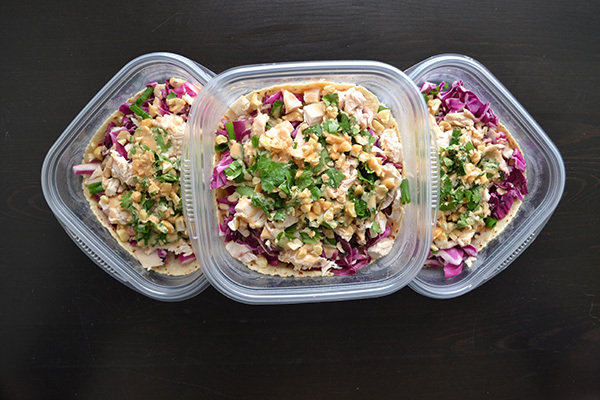 rotisserie chicken breast, cashews, cilantro or parsley, and green onions. Drizzle with 2 Tbsp. Peanut Lime Dressing. 6. Prepare the turkey or veggie burger. 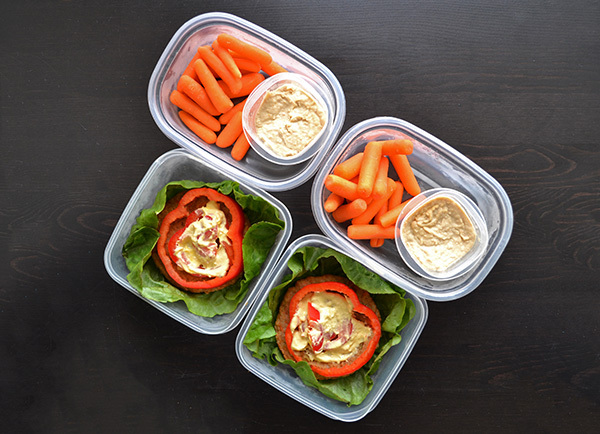 Set out two food storage containers and place a lettuce leaf and a tomato slice in each. Serve with one turkey burger or veggie burger patty that has been microwaved or toasted and topped with mustard. For a side, serve with ½ cup baby carrots or chopped bell peppers and ¼ cup hummus.